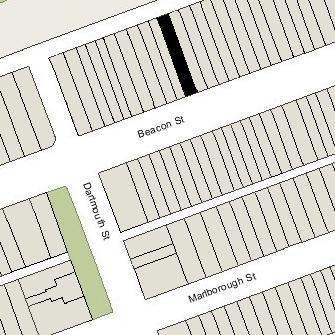 214 Beacon is located on the north side of Beacon, between Clarendon and Dartmouth, with 212 Beacon to the east and 216 Beacon to the west. 214 Beacon was built ca. 1863, one of a symmetrical pair of houses (214-216 Beacon), with 214 Beacon three feet wider than 216 Beacon. Each house originally had a one-story oriel. The oriel at 216 Beacon had been extended an additional story by the early 1940s; the oriel at 214 Beacon was extended an additional story in the mid-1980s. 214 Beacon was built for John Sargent Barstow on land he purchased April 6, 1863, from attorney William Dehon, part of a 100 foot wide parcel William Dehon had purchased on June 13, 1862, from the Boston and Roxbury Mill Corporation. When William Dehon sold the lot to John Barstow, he included language in the deed limiting the height of any stable built at the rear to no more than thirteen feet. Click here for an index to the deeds for 214 Beacon. 214 Beacon became John S. Barstow’s home. He was unmarried and his mother, Nancy (Forrester) Barstow, the widow of Dr. Gideon Barstow (a physician, merchant, and US Congressman from Salem, who had died in 1852), lived with him. Also living with him were his brothers, John Sargent Barstow, Simon Forrester Barstow (a Lieutenant Colonel in the US Army, later brevetted a Brigadier General), and Daniel Hathorne Barstow (a First Lieutenant in the US Army), and his sister, Catherine Barstow. In August of 1864, John Barstow purchased a 53 acre farm on the west shore of the Sakonnet River in Portsmouth, Rhode Island, and built a house designed by architect John H. Sturgis, who had designed 212 Beacon the previous year. John Barstow, his mother, and his siblings made it their primary residence. On March 21, 1865, 214 Beacon was purchased from John S. Barstow by Nathan Appleton. By 1866, 214 Beacon was the home of Edward Brooks, an attorney. He was a widower, his wife, Elizabeth (Boott) Brooks having died in June of 1865 in Paris. He also maintained a home in Medford. 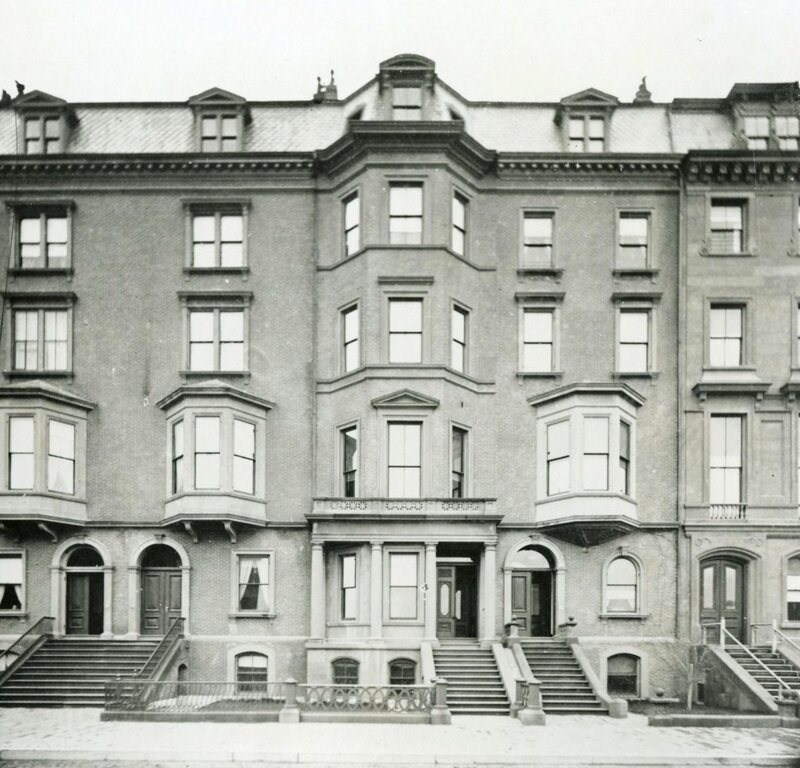 He continued to live at 214 Beacon until about 1869, when he purchased and moved to 97 Beacon. On May 11, 1869, 214 Beacon was purchased from Nathan Appleton by Daniel Sargent Curtis. He and his wife, Ariana Randolph (Wormeley) Curtis, made it their home. They previously had lived at 76 Mt. Vernon. They also maintained a home in Chestnut Hill. Daniel Curtis was a banker. He retired in 1876 and moved with his family to Europe. They subsequently lived at the Palazzo Barbaro in Venice and leased 214 Beacon to others. During the 1876-1877 winter season, it was the home of Mrs. C. W. Sullivan. During the 1877-1878 winter season, 214 was the home of Edward Gray, a cotton buyer, and his wife, Elizabeth Gray (Story) Gray. They previously had lived at 71 Marlborough with her grandmother, Elizabeth Gorham (Gray) Story, the widow of Franklin Howard Story. They had moved to 225 Beacon by 1879. 214 Beacon was not listed in the 1879 and 1880 Blue Books. During the 1880-1881 winter season, 214 Beacon was the home of John Heard. The house was not listed in the 1882 and 1883 Blue Books. On July 6, 1883, 214 Beacon was purchased from Daniel S. Curtis by Gamaliel Bradford. 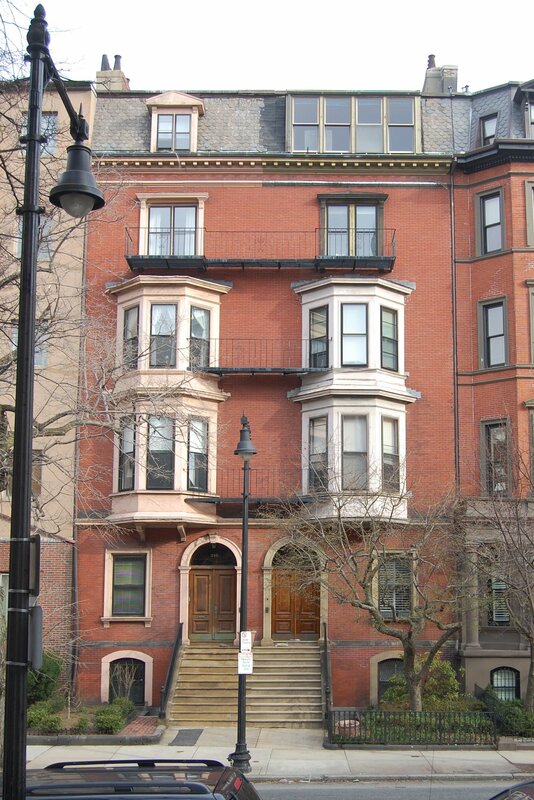 He lived in Cambridge and in 1888-1889 would build the Hotel Austerfield apartments at 7-9 Massachusetts Avenue. On August 1, 1883, 214 Beacon was acquired from Gamaliel Bradford by his nephew, William Bradford Clark, the son of Eliphalet Mackensie Clark and Fannie (Bradford) Clark. By the 1888-1889 winter season, William Clark was joined at 214 Beacon by his mother, who had remarried in July of 1878 to Harvard Latin professor George Martin Lane. He was traveling abroad. They continued to live there during the 1890-1891 winter season, but moved thereafter to the Hotel Austerfield. On July 1, 1891, 214 Beacon was acquired from William B. Clark by Fanny Gore (Bradford) Cutler, the wife of Dr. Elbridge Gerry Cutler. He was a physician and also maintained his medical office at 214 Beacon. They previously had lived (and he had maintained his office) at 275 Clarendon. They also maintained a home in York Harbor, Maine. In March of 1889, Fanny Cutler’s mother, Eliza Edes (Hickling) Bradford, the widow of Charles Frederick Bradford, had purchased 218 Beacon as her home. In January of 1905, Fanny Cutler purchased 216 Beacon, which she leased to others. In August of 1905. her brother, Dr. Edward Hickling Bradford, purchased 220 Beacon, and he and his wife, Edith Annie (Fiske) Bradford, made it their home. Elbridge and Fanny Cutler’s two children, George Hillard Bradford Cutler and Anna Williams Cutler, lived with them at 214 Beacon. George Hilliard Cutler died in September of 1918. Elbridge Gerry Cutler died in June of 1929. Fanny Cutler and their daughter, Anna, continued to live at 214 Beacon. Fanny Cutler died in October of 1932. Anna Cutler continued to live at 214 Beacon. In March of 1949, she applied for (and subsequently received) permission to install fire balconies. The balconies were required in conjunction with her application requesting permission to convert 216 Beacon into a lodging house. 214 Beacon remained a single-family dwelling. 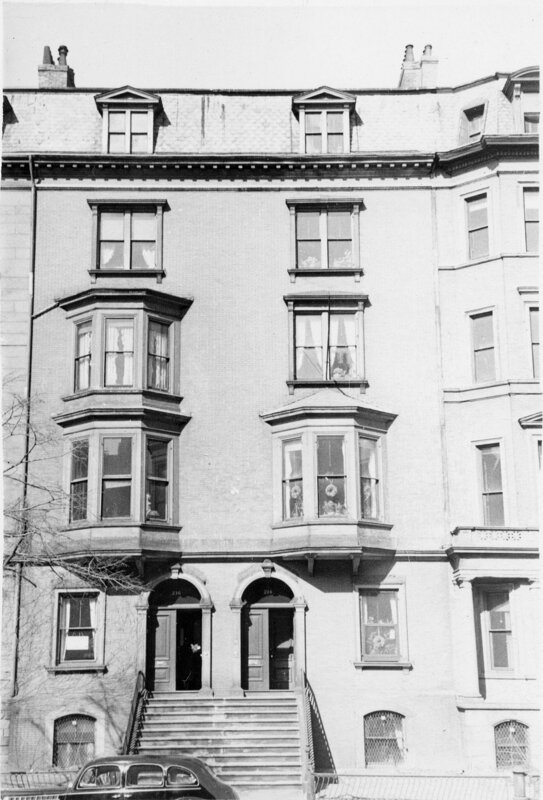 Anna Cutler continued to live at 214 Beacon until her death in December of 1969. In her will, Anna Cutler left 214 Beacon and 216 Beacon to her four first cousins, the children of her uncle, Edward H. Bradford: Robert Fiske Bradford; Edward Hickling Bradford, Jr., Charles Hickling Bradford, Jr, and Elizabeth Bradford. On July 22, 1970, 214 Beacon and 216 Beacon were purchased from the Bradford family by Tobias R. Hanks and Michael J. Underhill. In August of 1970, they filed for (and subsequently received) permission to convert 214 Beacon into five apartments. On August 10, 1970, they transferred both properties to Underhill and Hanks, Inc., and on July 29, 1972, they transferred them to themselves as trustees of the Underhill and Hanks Trust. In October of 1974, they filed for (and subsequently received) permission to replace the existing front dormer on the fifth floor with four windows, and in January of 1977, they applied for (and subsequently received) permission to replace the existing dormer on the rear with five windows. On May 16, 1977, 212 Beacon was purchased from Tobias Hanks and Michael Underhill by Frederick V. Casselman and his wife, Susan M. Ashbrook. In August of 1984, they filed for (and subsequently received) permission to reduce the number of units from five to three. As part of the remodeling, they extended the second floor oriel to the third floor. 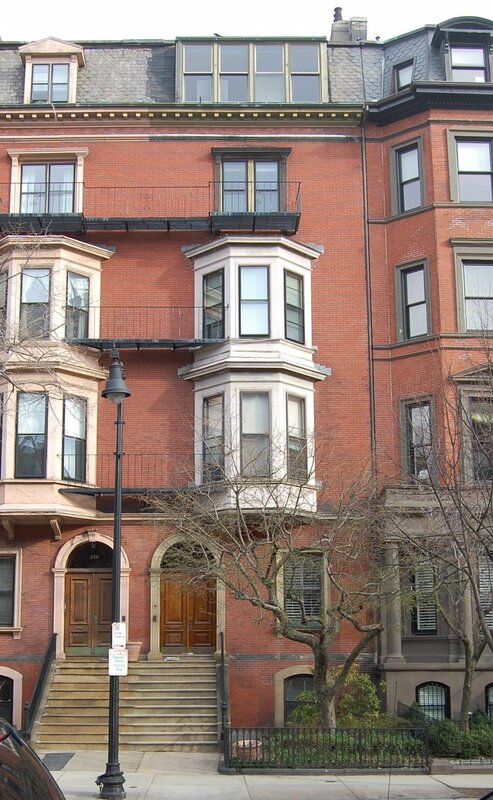 On November 19, 1984, they converted the building into three condominium units, the 214 Beacon Street Condominium.